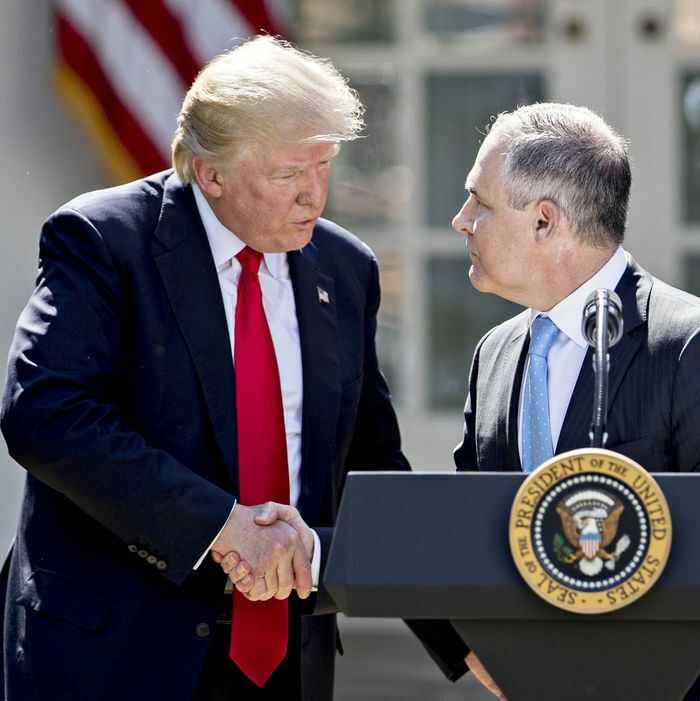 Scott Pruitt, administrator of the Environmental Protection Agency (EPA), right, shakes hands with President Donald Trump at the White House, on Thursday, June 1, 2017, the day Trump announced the U.S. would withdraw from the Paris climate pact. The importance of this anecdote is not merely that Trump is standing behind his comically scandal-tarred EPA head. It’s that it suggests he and Pruitt may be scheming to shut down the Mueller investigation. If Trump had an easy and risk-free way to stop Mueller, he would have done it already. His biggest problem is Sessions, the attorney general, who has infuriated Trump by recusing himself from the Mueller investigation and failing to prosecute Trump’s enemies. Trump’s main barrier to replacing Sessions is the difficulty of winning Senate confirmation for the kind of toady Trump craves. The straightest shot he has is by using something called the Federal Vacancies Reform Act. This 1998 law allows Trump to fill a vacated Cabinet position with any person who has been confirmed by the Senate for another position. So, if Sessions were to leave — how he leaves could matter a lot, but put that aside for the moment — Trump could install, say, Pruitt in his place, since the Senate already confirmed Pruitt for EPA administrator. And Pruitt could serve for up to 210 days without Senate confirmation — long enough to fire Mueller and all his staff. If Trump wants to use the Vacancies Act maneuver, he could pick any Senate-confirmed figure in his administration. But Pruitt is in some ways the ideal candidate. He’s a lawyer, deeply loyal to Trump, and, most importantly, is not hung up on following ethical rules or norms. Indeed, Pruitt is Trump’s most flamboyantly corrupt Cabinet official, with new scandals coming out daily. Pruitt’s ability to withstand constant revelations of unethical and/or illegal behavior is a strong sign of his willingness to carry out Trump’s wildly unethical goal of turning the Justice Department into his personal rent-a-cops. Now, the question of how such a vacancy would occur matters a lot. If Sessions were to resign, Trump would have a clear path to replacing him without the Senate. If Sessions was fired, the law is murkier, and Trump would have a court case on his hands. This would certainly explain why Trump has subjected Sessions to months of public and private humiliation. He is trying to induce his AG to quit rather than having to fire him. If Trump reaches a point where he has to stop the Mueller probe quickly, he might pull the trigger, fire Sessions, and take his chances that the court will rule his way on the Vacancies Act. Trump’s behavior toward Sessions appears erratic and irrational. And it might be nothing more than an extended tantrum. But his behavior is also perfectly consistent with a cunning ploy to find a legal path to firing the special counsel. The news that Pruitt and Trump speak about Sessions is compelling evidence for the latter scenario.